While our president's moral character seems stuck somewhere between boorish and brutish, it's only fair to note that he also has an aesthetic dimension. This surprising side of Trump popped out several days after the Charlottesville attacks by raging white supremacists. In a presidential tweet, he said: "Sad to see the history and culture of our great country being ripped apart." Yes, very sad to see a resurfacing of raw bigotry ripping so viciously into America's historic attempts to create a culture of mutual respect and unity in a nation of extraordinary diversity -- e pluribus unum, as our national maxim puts it. Oh... wait. That's not what Trump meant. 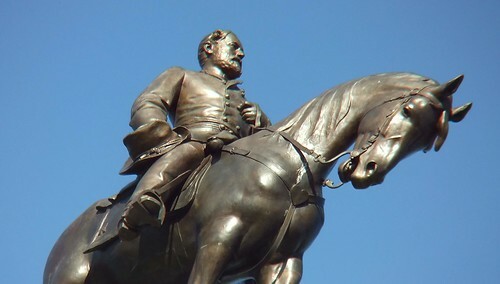 He was actually advocating keeping the statues of Confederate champions of racism -- pieces of bronze and granite that publicly celebrate America's shameful history of slavery, secession, and white supremacy. The KKK thugs invaded Charlottesville in violent objection to the city's planned removal of a statue of Robert E. Lee, who led the southern states' war against the United States so they could keep enslaving African Americans. Trump's lament, then, was not about the attack on America's better angels, but merely about "the removal of our beautiful statues." Apparently, it never occurred to him that most Americans don't consider those statues either "beautiful" or "ours." Ironically, Robert E. Lee himself opposed erecting Confederate statues across the south: "I think it wiser not to keep open the sores of war," he said, but instead "to obliterate the marks of civil strife." We could use a leader with such wisdom today, when bigots feel newly empowered to incite civil strife across our nation.